I'm not 100% sure if the poster Dragons_Blood and Eddy Kay on G+ are the same person? feel free to let me know, I would be happy to discuss this further if needed. RH - Who’s fault is it? Is someone holding a 3D printed gut to their heads? Using a broken system is not an excuse. RH - Other choices include, releasing the exact same documentation you use for the patent out into the public domain as Prior Art, and then happily manufacture these designs. This can be done directly or by allowing the Patent application to lapse, then it becomes Prior art and no one can then patent, but anyone can use the idea / method. RH - See above about public domain and prior art. - Most of the open-source and maker community is not concerned about companies fighting over patents, infringements and IP, that’s their choice for constantly going down that route. 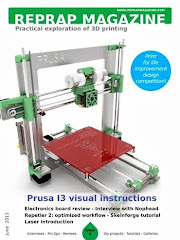 - What would have made all the difference is if Makerbot made a statement saying they will not go after anyone in the open-source community, or designers where inspiration for these types of ideas also appeared. The fact they have patented so many interesting aspects of Home 3D printing that are also being developed in the open-source community and that they have not engaged at all with that community on this aspect, means they want ownership of patents covering these things, and they didn’t want to highlight what they were doing ‘in the background’. Many companies face this ‘big business problem’ that’s fine – it’s clear that Makerbot is not going to stop down that route, they have stated many times now “we need strong patents” – the concern is over what they intend to do with them and that they have not been open with an open-source community they once held closely at the heart of their business model. - Over on Google+ if you search you will find an this post from Jan Wildeboer who claims he offered to assist Bre Pettis (Makerbot) over a year ago with similar type of promise to the ‘community’ – I find it a real missed opportunity that was not taken up or used as a guide for a similar statement from Makerbot – if it had, this would not have caused such a bad feeling of betrayal and brocken trust within the open-source/RepRap community and Makerbot’s patents. Jan's G+ Post - "Dear +MakerBot , here's an idea for you to ponder. Take a look at http://www.redhat.com/footer/patent-promise.html The Red Hat Patent Promise. To put it in simple terms, we at Red Hat apply for patents, mostly out of defensive reasons in a world of patent trolls. But we are fully aware that we must defend the freedom of Open Source and Open Innovation. So we have the legally binding promise that we will never use our patents against developers of Open Source software. It's not the perfect solution, but it is definitely better than your current approach of filing patents and not declaring what the community can do or NOT do. A year ago I offered +bre pettis my help in working on a similar approach for Makerbot, this however never happened. I am still ready to help and hook you guys up with my network. I think you could have avoided a lot of negative vibes with a patent promise in the Red Hat style." - Pledges like the RedHat Patent promise not to go after open-source contributors to a project / technology are already being used by companies that need to have strong patents for legal defence, but also do not want to alienate a community that supports them and can often lead to ideas worth patenting. - Without this sort of statement, what are people to think? How will Makerbot use their power and Patent arsenal? For or against an open source community or open-source company? Who knows, but waiting to see is going to be too late. RH - Companies design around patents all the time, and produce more innovative products in the process, also producing more IP that can then be opened up or kept secret, whatever works for you. RH - Why would you assume that? One of the only reasons to have a patent it to get some leverage from it, by making someone else afraid to go near your patented method in-case they say you infringe. Or to attack someone (a competitor doing quite well in the market, but not well enough to defend a big legal battle). And then also to have a patent armoury as a final card to play if someone comes after you. RH - Ransom, Threat, Stalemate, stand-off, war, stranglehold, limiting innovation that's what patents have come to stand for. You can decide to patent almost anything, if you have enough money and think it will benefit you. RH - The Patent system was supposed to stop things in the public domain being patented in the first place; the scenario above will always appear if companies decide to gather as many patents in an area as possible with the intention of patent litigation in the future. Most patents are vague for the very reason of letting some later process in the courts or by expert testimony win over an infringement claim, or so simply sink the other party in legal debt before the case is finished. RH - It’s too late once they sue a growing open source company - who will already be on their radar - like Printrbot, Ultimaker or RepRapPro for Patent infringement, what they could have done is make a Patent promise not to go after these types of open-source companies in a similar way to how Red-Hat handled their growth. That’s the true missed opportunity to unite a now big company like Makerbot with an entire (and very smart) community to forge trust, rather than shatter and divide it. RH - That takes true vision and courage, Bre Pettis could have pulled it off if that’s what he wanted to achieve with Makerbot and the wider 3D Printing community. That’s what I'm personally disappointed about. Other posts have appeared over the last week on the Makerbot Patent/trust storm, including some high-profile sites shining a big spotlight on the debate. Even Adafruit themselves do not seem to be able to decide if they want to stock Makerbot/Stratasys products. John does mentions Red Hat, but unfortunately not the point about a patent promise I talked about above. 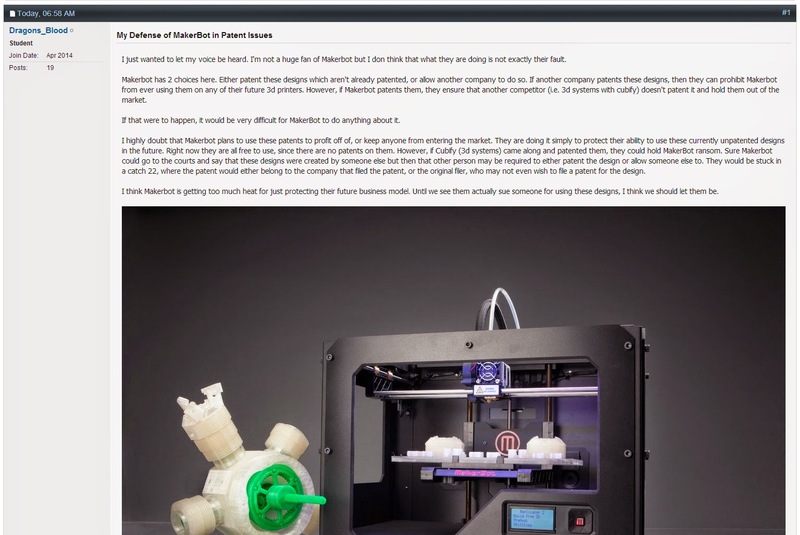 Makerbot finally released a statement, (here on TechCrunch) it's bland sees right past the issues of trust and duplicity with the 3D printing community. The arguments could easily rage on back and forth, If Makerbot only want to focus on the Quick-Release Extruder - Members of the community have highlighted extruder designs that have the bistable spring implementation posted to Thingiverse as early as 2011 http://www.thingiverse.com/thing:7129 "by MiseryBot, published Mar 19, 2011" Not quite as "slick" but it does have that key "bistable" bit.﻿ Makerbot, I feel you are now on your own. The sun is shining, and I have real 3D printing to do, so the next Blog post will be a return to all things RepRap. Promise. Thanks for reading, it was rather a lot of text.